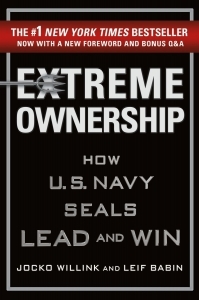 Sent to the most violent and dangerous battlefield in Iraq, Jocko Willink and Leif Babin’s SEAL task unit faced a seemingly impossible mission: help U.S. forces secure Ramadi, a city deemed “all but lost.” In gripping, firsthand accounts of heroism, tragic loss, and hard-won victories in SEAL Team Three’s Task Unit Bruiser, they learned that leadership—at every level—is the most important factor in whether a team succeeds or fails. Willink and Babin returned home from deployment and instituted SEAL leadership training that helped forge the next generation of SEAL leaders. After departing the SEAL teams, they launched Echelon Front, a company that teaches these same leadership principles to businesses and organizations. They have helped scores of clients across the full spectrum of industries. From promising startups to Fortune 500 companies, Babin and Willink have helped scores of clients across a broad range of industries build their own high-performance teams and dominate their battlefields. The compelling narrative, powerful instruction, and direct applicability, had an immediate impact on leaders across the world, driving Extreme Ownership to become the new standard for leadership books. It has revolutionized leadership and challenges leaders everywhere to fulfill their ultimate purpose: lead and win. The runaway New York Times bestseller, now with a new cover, foreword, and photo insert!